There will not be a workshop in April. 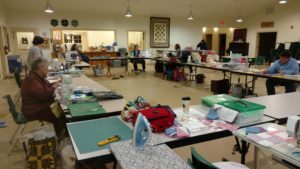 Quilt camp is April 24th to 27th. Contact Mary Moore quiltypeep@gmail.com for more information, Remember that the May meeting will be the Challenge Quilt show and vote of favorite of the members. Please bring it in an opaque bag so that the voting of members will not be swayed by who made it. In June Cathlyn from Hospice of the North Country will do a short talk about hospice and receive our donated quilts. Donna Hastings did a great workshop on how to work with orphan blocks and creative designs for quilts. More photos are up on the Photo page. The reveal will be in May with prizes for the most original panels. This will give everyone a chance to show their creativity and ability.